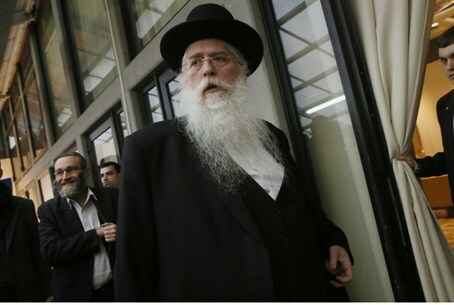 MK Meir Porush of the hareidi-religious Yahadut Hatorah (Gimmel) party reacted Sunday to the government’s decision to pass a bill on hareidi-religious army enlistment. “This is a sad day for the hareidi-religious Jewish world. This day will be recorded as a dark day for the Jews living in the land of Israel,” he declared. “The government’s abuse of the hareidi-religious minority borders on persecution and cruelty,” he continued. “They have no mandate from the United Nations to run the country this way,” he argued. In the 1940s, hareidi-religious leaders reached an agreement on religious issues with then-Jewish Agency Chairman and later Prime Minister David Ben-Gurion - what is now known as the "status quo" agreement. The goal of the agreement was to present a united front to visiting U.N. officials and to demonstrate that the new state of Israel would not impinge on the hareidi-religious way of life. Porush had criticism for the Bayit Yehudi (Jewish Home) faction in particular. “The Jewish Home burned the home down already, and now is playing a part in destroying the hareidi-religious home,” he accused. The government voted with 14 in support and four abstentions to pass a law that will require a majority of hareidi-religious men to enlist in the army. Until recently most hareidi-religious men were exempt from army service under the Tal Law, which granted an automatic deferral of service to full-time Torah students.